You are currently browsing the tag archive for the ‘Patina’ tag. I spent the day today looking at some of the pots I have collected. Two of those pots are in the photo below. They were both made in Tokoname but by different potters. What jumped out at me today was the differences in the glazes. 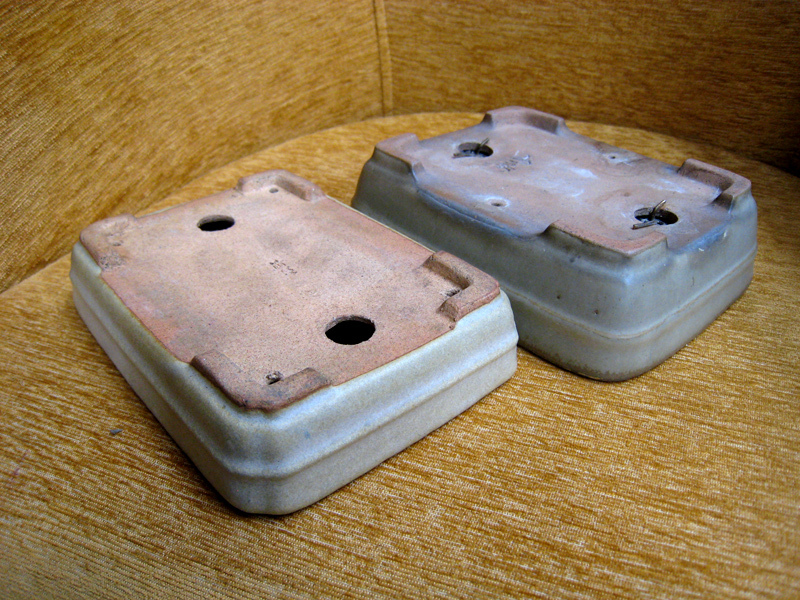 They are both cream pots and from what I can tell, they would have both looked very similar in colour when they were brand new. Where the difference lies is that the Yamafusa pot has the beginnings of a really nice patina forming on it. Neither pot is particularly expensive but the patina that has started to form really starts to give the feeling of age to the Yamafusa pot. What is patina? As far as I can tell, patina is a build up of grime and oils that attach themselves to the surface of pots. Once on, it is a permanent reminder of its past. Patina tends to form at the base of the pot and slowly creep its way up to the rim. If you look at the image above you can see how the patina is really starting to darken nicely along the bottom edge of the pot. I asked about patina and pots when i was in Japan and it was explained to me that the pot you use for a tree should appear a similar age to the bonsai. If you have a 100-year-old tree, then you should find a pot that also has the appearance of being 100 years old. An old tree with a brand new shiny pot just doesn’t look quite right. If you look closely through old Japanese exhibition albums you will see that almost every pot in the show will have a rich patina. Sometimes this is so pronounced that pots that were once cream are dark grey and look truly ancient. I think I will have to get these pots back out under the benches so they can continue ageing and perhaps one day they will be a nice shade of grey. I have tried a few ways to artificially age pots but none have work very well to date. If anyone has any sneaky techniques to create patina please share them in the comments.